No, your eyes are fine and these banknotes aren't something out of Minecraft. Actually, it's the new Norway currency design, set to roll out into circulation in 2017. 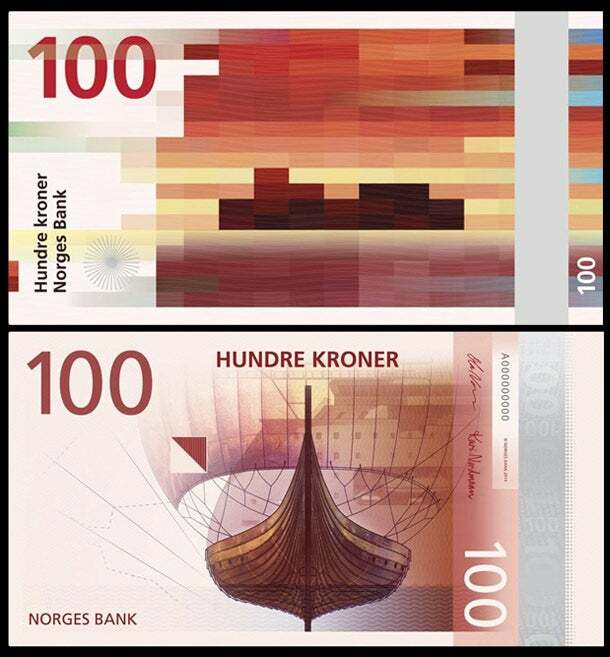 Norges Bank, the central bank of Norway, released artistic currency motifs by two Oslo-based design firms, chosen among proposals from a competition. The designers were tasked with trying to depict the ocean in works of art as homage to the Norwegian national identity. The front takes a more traditional approach by presenting depictions of life at sea, designed by The Metric System and Terje Tønnessen titled Norwegian Living Space. It's a cool contrast to the pixelated colored seascapes on the back, a series called Ripple Effects by Enzo Finger. A bit of trivia? Besides the fact that the banknotes are a fusion of modern and traditional art, it has a surprise element that you'll notice only if you look closely- the higher the values of the banknotes are, the more abstract the pixelated artworks become.